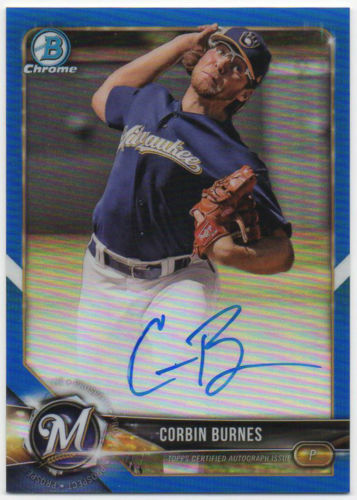 I viewed Burnes as the best best to crack the rotation entering the season and I view his stuff to be the best as compared to counterparts Freddy Peralta and Brandon Woodruff. Incidentally, I view Woodruff as having the best pitcher physique to support a heavy workload. I bought this Blue Refractor Auto on a whim one night and tripled my money with one start. But this should be a lesson to prospectors as Burnes didn’t do as well in his next start killing the buzz. If you get an increase like this most of the time you should sell and not look back.